Move from Basecamp to Redbooth and discover high-performance project management. 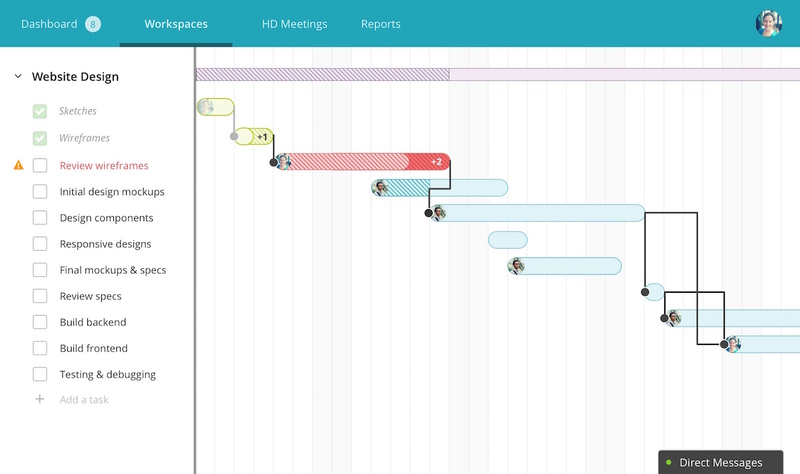 Without a built-in Gantt chart generator, it's hard to keep your projects on track. By switching from Basecamp to Redbooth you can get every member of your team back on the same page. Get your team's data out of Basecamp and into Redbooth in just a few simple steps. Boosting productivity is easy in Redbooth because it adapts to how you already work. Create shared workspaces, schedule online meetings, chat with team members at a moment's notice, and keep important projects on track and on time. With Redbooth, you don't have to waste time drawing Gantt charts on whiteboards or painstakingly building them out with colored boxes in spreadsheets. Just click one button and your chart appears. Add dependencies or drag and drop to change the deadlines. Discover the power of Redbooth’s Timeline view. Switch from Basecamp to Redbooth and see why thousands of companies are using Redbooth for visual project management.